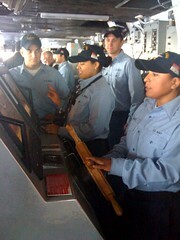 Just over a week ago, I was able to participate in a “distinguished visitor” embark aboard the U.S.S. Ronald Reagan. It was an incredible, unforgettable, and overwhelming experience. I hurried to post a video documenting the trip, which weighed in at over 13 minutes, but it still covered only some of the moments that remain seared in my brain from that day. I’ve been remembering and reflecting upon the carrier embark ever since, and still can’t find an elegant, eloquent way to summarize the journey. You can’t neatly wrap up a 100,000-ton ship with a ribbon and bow. 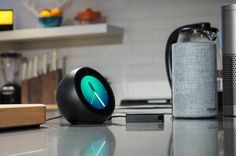 So, taking a cue from übergeek Guy Kawasaki, I’ll just take you through the day from beginning to end. My telling won’t be quite as epic as Guy’s blog post, but I hope it’ll still convey what it felt like to visit an aircraft carrier, and to meet the men and women that bring it to life. I was excited to discover that fellow blogger and podcaster Vernon Brown was also invited, but it turned out he was ineligible as he was active duty military. After a quick IM conversation with L.P. “Neenz” Faleafine, I suggested that she be invited instead. 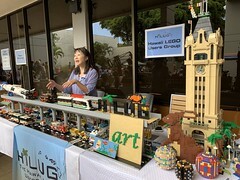 Bill Doughty took one look at her blog (and a recent entry about Kauai), and she was in. Periodically over the next few weeks, I got friendly updates from LTJG Theresa Donnelly (Community Relations Director, Public Affairs, Commander, U.S. Pacific Fleet), meanwhile filling out medical forms, scary looking waivers, and providing a brief biography (which ultimately came down to “I am a geek”). She sent links to help us get a feel for what to expect, from the PBS series “Carrier” to blog posts from other embarks. In fact, the advance process was so organized and helpful, it went a long way toward easing my simmering terror. Eventually we got word that the U.S.S. Ronald Reagan was heading our way from San Diego. The date was set. 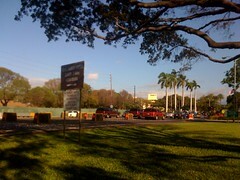 I arrived at Nimitz Gate at Hickam Air Force Base almost an hour early, then spent almost half and hour making sure I was at Nimitz Gate and that Nimitz Gate was where I was supposed to be. I knew I was losing my mind when I spent another ten minutes scouring my van for a camera that I’d had in my pocket the whole time. When Neenz arrived, I was immensely relieved… especially when we both quickly confessed how scared we both were. 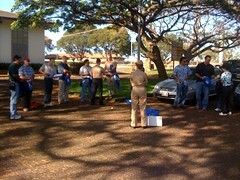 At the appointed time, we joined a group that had assembled in the parking lot, where LTJG Donnely and MC1 Michael Tuck greeted us and handed out our information packets. They also collected a $25 fee to go toward some souvenirs of our journey. We were especially happy to meet LTJG Donnelly, who had been the voice of confidence and reason that kept us from freaking the hell out over the preceding month. We then all jumped in our cars and formed a caravan to drive onto the base. It was a short drive. We parked in a lot less than 100 yards from where we’d met, then jumped into a couple of vans. We made small talk with our driver, and Neenz tried to wrestle some advice out of him for the flight out to the carrier. Like any good solider, however, he was appropriately cagey, telling us only that it would be “memorable,” and that we’d get all the information we needed in our preflight briefing. 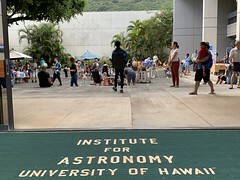 Like any good geek, I asked everyone in the van, “Who here is on Twitter?” Apart from Neenz and I, only one person raised her hand: Dara Young (@HawaiianVillage), Regional Director of Public Affairs for the Hilton Hawaiian Village. 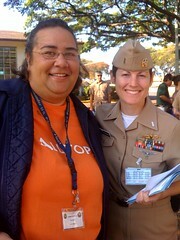 Eventually we arrived at a visitors lounge right on the edge of the Hickam flightline, where we were greeted by Capt. 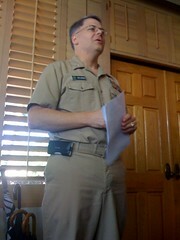 W. Scott Gureck (Director, Public Affairs, Commander, U.S. Pacific Fleet). He welcomed us, and explained that our carrier embark was taking place on a special day: the anniversary of the Battle of Midway. He also shared a “proud dad” moment, as he has two sons that will be starting at the Naval Academy this summer — one of whom just graduated from Radford High School. They then showed two videos… and they couldn’t have been more dissimilar. The first was titled “Seapower,” and it was a slickly produced slideshow with Ken Burns transitions and stirring music. The second was shaky underwater video footage recently captured off the coast of O’ahu, where the Navy was beginning work on repairing the damage done during the February grounding of the U.S.S. Port Royal. As inspiring as the first video was, I found the second video more compelling, simply because it was an acknowledgment of a Navy accident, and a straightforward overview of what the Navy was doing to account for it. 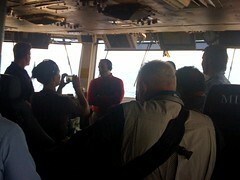 We then got a briefing by Lt. Cmdr. 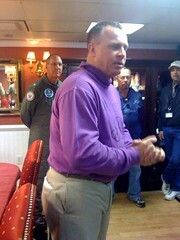 Geoff Stow, the Officer in Charge of the air detachment that was flying us out to the U.S.S. Ronald Reagan. He described the trip as “a unique experience,” and outlined what we’d see and hear aboard the “C.O.D.” We’d be seated backwards in a cargo plane with only two tiny windows and exposed systems — wires, pipes, and moving parts. He also acknowledged that people have been known to get sick during the flight. 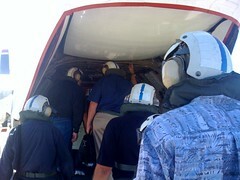 We were then introduced to our safety gear: a flotation vest, helmet, goggles and ear protection. I think at least one member of our party decided to opt out of the trip at this point. We suited up, trying not to put things on upside down or backwards. The gear around my neck, the goggles, and the ear protection suddenly made me feel even smaller (and awkward) than I had already felt, like an alien on my own planet. We headed out into the bright sun for a group photo, then we jumped back into the vans to be driven out to the C-2 Greyhound. Though we were told it’s basically the largest aircraft that can land on the deck of an aircraft carrier, everyone was still surprised to see how small it was. The air was hot and vibrating with the power of the spinning engines, and we climbed into the cargo area where it looked like the passenger seats had only been installed as an afterthought. It was incredibly dark as well, and when I finally stepped inside, I saw Neenz emerge from the “back” of the plane, eyes boggling. 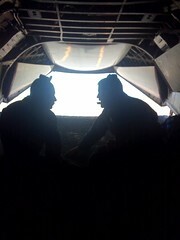 We ended up sitting in “front,” next to one of the tiny round windows and facing the cargo door. We enjoyed what light we could get, until they closed things up. Putting on the five-point harness was very nearly a fiasco. Forget those seat belts you’d get on a commercial fight. Instead of two straps with one simple lever, the restraints on the C-2 were a veritable Rubik’s Cube. The buckle is round, attached to the seat between your legs, with slots on the side and the top. There’s a star-shaped knob for release. You had to attach the lap straps first, pull them tight, then attach and tighten the shoulder straps. (Do this backwards, and you could end up with the buckle at your neck.) It might not sound like a difficult task, but we had to do it while wearing a heavy vest and goggles inside a space that was dark and shaking. The plane vibrated and rocked the entire time, and the ride seemed just as bumpy when the plane was stopped as it did when moving. Also, the floor of the cargo bay soon filled up with white smoke, and the aisle down the middle of the plane was basically a swirling river as deep as my knees. On a commercial flight, the sight would’ve send me running for the door. But since nobody else seemed concerned, I just tried to ignore it. The takeoff was uneventful. Or at least as uneventful as a takeoff can be, facing backwards in a dark metal box filled with smoke and swinging wires. We then settled in for an hourlong flight over the Pacific. With the drone of the engines and our ears safely shielded, there was no small talk to be had, so both Neenz and I just closed our eyes and tried to relax. Then it was over. I grabbed Neenz’s knee and screamed, completely involuntarily. We yelled and laughed. We survived. The plane bumped and rocked, and I figured we were taxiing across the deck. 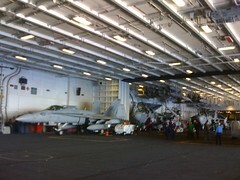 But after the shaking continued for a minute or so, I started to wonder just how long the aircraft carrier actually was. Eventually, the cargo door slowly opened, and as the blinding sunlight streamed in, I half expected to hear the strains of “Also Sprach Zarathustra.” I could make out shapes, then people, then realized that we’d been stopped the whole time. We somehow managed to get unbuckled and stepped down and out onto the deck. It felt so solid and stable, I would have thought we were still on land if it weren’t for the ocean stretching to the horizon in every direction. The deck was crowded with planes and helicopters of seemingly every variety, and probably a hundred people doing a hundred different jobs. There were several people clearly focused on our group, standing and watching, only extending a firm but polite arm whenever one of us started to stray from the pack lest we wander into a spinning propeller or jet engine. A couple of Navy people in green vests were set up with a tripod and video camera, no doubt documenting our expressions of shock and awe. There was too much to take in, but they didn’t waste any time shepherding us over to “the island,” through a door, and down the steepest flight of stairs I’ve ever seen. They were more like slightly tilted ladders. We were relieved of our headgear and vests, and led into an astonishingly elegant red-walled room with dark wood furniture, fancy fixtures, and all the trappings of a White House stateroom. There we were welcomed aboard by Capt. Ken Norton and Admiral Scott Hebner. They quickly explained that the room was indeed modeled after a White House chamber decorated by Mrs. Nancy Reagan, and pointed out portraits of the ship’s namesake, Pres. Ronald Reagan. Along one wall, an actual desk used by the former president. On it was a model of the U.S.S. 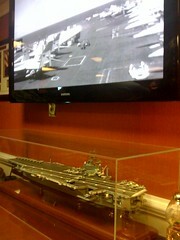 Ronald Reagan, and above it, one of many large-screen displays we would see throughout the ship that showed a live feed from cameras on the flight deck. We were also introduced to Lt. Ron Flanders (U.S.S. 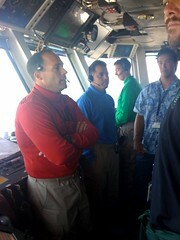 Ronald Reagan Public Affairs), who in turn introduced the members of his team that would be taking us around the ship. Before the ship tour began, we all took group photos with Capt. Norton and Adm. Hebner. 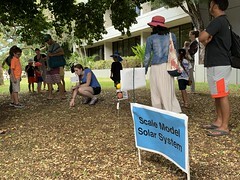 One of the largest delegations with us were affiliated with the Polynesian Voyaging Society. Neenz and I apparently constituted the “Social Media” group. Our first stop was the hangar bay. It was enormous. Of the 4,700 people aboard the U.S.S. Ronald Reagan, 1,600 are part of Carrier Air Wing 14, which includes 61 aircraft. The hangar bay is where they’re maintained, repaired, and stored. And once again, you wouldn’t know you were at sea if it wasn’t for a huge opening that afforded a breathtaking view of the ocean. In fact, it was only while in the hangar bay did it become clear how fast the aircraft carrier was moving through the water. It was surreal to stand with you feet on what seemed like solid ground, but look out at the Pacific whipping past at 20 knots. I’d never think a ship as large as that “city at sea” could move that fast. 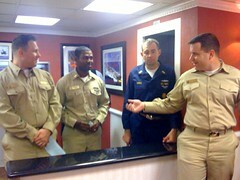 We were also introduced to two locals working aboard the U.S.S. Ronald Reagan: HM3 Erika Clawson, Hospital Corpsman 3rd Class, and AS2 Yancy Zuniga, Aviation Support Equipment Technician 2nd Class. Both were experiencing “so close and yet so far” syndrome as the carrier slowly passed south of their home. It didn’t take long before we were talking story in true Hawaii style. I discovered that Clawson grew up on the same street I did (Kaonohi Street in Pearlridge), less than a block from where Neenz lives now. And Zuniga was a 2004 graduate of Pahoa High School. “Wow,” I said. “You’re a young one.” And that observation would be one I’d make throughout the day. The average age aboard the ship is 22, and that means many of the people we met and observed were teenagers. Again, hearing the statistics was one thing, but seeing those bright, fresh faces was something else entirely. Say what you will about the typical young person today, it was impressive to see these kids working so hard, with such discipline. At 19, I could barely do laundry without turning everything pink. 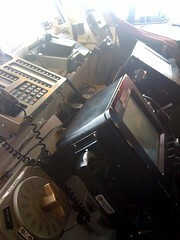 Then it was time for lunch, which led us a couple of decks below into the inner bowels of the ship. 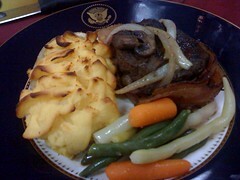 We got to dine in the officer’s mess, which was much nicer than the industrial cafeteria I was expecting. And the food was great. Bacon wrapped steak filets topped with sauteed onions and mushrooms, accompanied by whipped potatoes in potato skins and vegetables. Dessert was cheesecake. Unfortunately, I was only able to eat a couple of bites of steak, because I found myself getting just a little bit seasick. I felt fine on the flight deck and in the hangar, where the horizon was within view, but in the windowless officer’s mess, the slow rocking of the carrier was suddenly distracting and disorienting. I felt, or thought I felt, our forward momentum on the sea, and my inner ears were protesting. So I mostly tried to make small talk, drank lots of water, and kept my eyes on the big screens showing the activity on the flight deck. 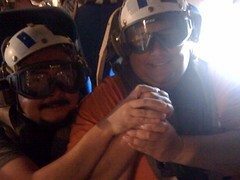 As it turns out, that was a good strategy, because flight ops got underway in the middle of our meal. 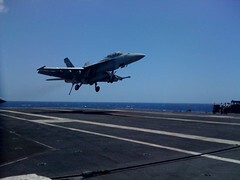 I watched several jets get launched off the carrier, each one causing the room to gently vibrate. Each time a plane lurched off the edge of the deck, the whole ship seemed to tip just a bit. Even separated by tons of steel, the sheer amount of energy being expended above our heads was palpable. Though I was mostly concerned with not turning green, I was impressed with one of the stories our table’s host told about a “man overboard” incident. He explained that the entire crew of the U.S.S. Ronald Reagan drills constantly, practicing every possible scenario from fires on the flight deck to a complete loss of power to losing someone in the water. He said that when someone falls off the carrier into the ocean, automatic sensors are triggered, alarms sound, and the entire “city at sea” commits itself to going back to retrieve their lost shipmate. 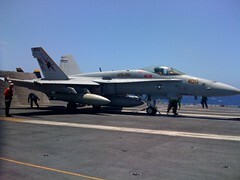 One night, a crewmember was climbing around on top of a fighter jet parked on the flight deck. It was pitch black. He finished his work, and jumped off the plane, expecting to land on the deck. Instead, he plummeted over 70 feet into the cold ocean. But when his sensors got wet, alarms went off all over the ship, and everyone sprung into action. He said everything went perfectly, just like their drills, and the man was recovered, embarrassed but otherwise unharmed. 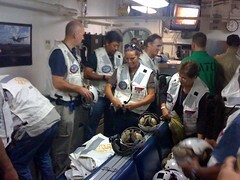 That the rescue operation was successful even at night was a particular point of pride. After lunch, we immediately burned whatever calories we’d gained by hauling ourselves six or seven flights of steep stairs up to visit the air control tower, the highest spot on the ship. Here we had the best view of the flight deck, and got to meet the people who choreographed the seemingly impossible ballet of steel and flesh below. It was a picture perfect summer day, the ocean a rich blue all around, except for the emerald green wash trailing behind the carrier. I admired the equipment, a fascinating mix of modern looking computers and displays and seemingly old-fashioned solid-state knobs and switches. One of the crewmembers pointed out that the technology on aircraft carriers was, in fact, older and less sophisticated than what’s used in civilian air traffic control towers. There was also a periodic, warbling whoosh of radar that my inner sci-fi geek couldn’t help but compare to the “DRADIS” sound effects from “Battlestar Galactica.” Suddenly, the physics of that imaginary world seemed much more real. One level down was the navigation bridge, a larger, longer space. There was a much bigger group of people here, all making sure the U.S.S. Ronald Reagan was going where it was supposed to be going, and lots of computer screens with maps and squiggly lines. I was absolutely tickled to discover, though, that there was still a “wheel” to steer. A surprisingly small, wooden one, being expertly handled by another surprisingly young woman. Even though she was steering a ship with a displacement of over 100,000 tons, she seemed quite calm as she nudged the wheel one way or the other every second or so. 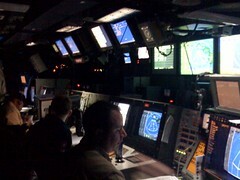 Next stop was the flight operations center, a small, dark room below the flight deck. This room was the apparent counterpart of the air control tower, concerned more with the status of the pilots and planes as they few. Arrival and departure times, fuel levels, and other readings are tracked here. Interestingly, we were told that it was only a few years ago that the comings and goings of planes were recorded and displayed on transparent sheets of plastic, names and figures written on them by hand, backwards, from the other side. The grid was shared with the rest of the carrier using closed-circuit cameras. And as great as it was to have the new, computerized system, it isn’t infallible… and once they had to make do with a Microsoft Excel spreadsheet. Right next door was the combat operations center. It was another dark room, but it was packed with people and equipment, perhaps the most advanced technology we’d seen on the ship. There were dozens of screens displaying thousands of bits of information. Here were the people who were in constant contact with the pilots, and who knew the location of every plane (including civilian air traffic). They were quick to point out that the U.S.S. Ronald Reagan had never seen combat, but it was clear they’d be ready. Finally, it was time for the main attraction. 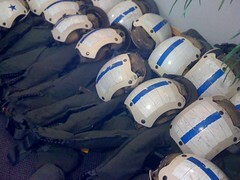 We were taken to a room for another briefing, and suited up once again with vests, helmets, goggles and ear protection. We were basically told, six different ways, to turn off the flashes on our cameras, to stay behind the indicated lines, and to listen to every instruction we’re given. 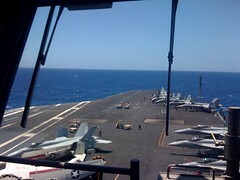 With that, we were led up to the flight deck, and stepped out into the sun. The air was hot and thick with the smell of aircraft fuel. And the level of activity was dizzying. We wove our way between parked planes, and were directed to stand along and behind a yellow line. I had just found my spot, and just caught my first glimpse of the first plane no more than thirty feet away, when there was a sudden and enormous explosion of noise and heat. The blast was intense, like getting thumped in the chest, as the plane roared down the deck. The speed at which it disappeared was unnatural, almost cartoonish, launched by both jet engines and a powerful catapult. Then again. And again. Barely any time would elapse between each launch, and my brain struggled to process everything that was happening. Each plane would roll into position, a barricade would rise behind it, a handful of people would check parts of the aircraft and signal to the pilot, and finally with a point and a salute, the plane would take off and knock us back. The planes needed only half the length of the deck to get airborne, and there was apparently a second launching pad on the forward, starboard end. They were lining up more than one jet at a time, and at a certain point, it looked like they launched two jets almost simultaneously. 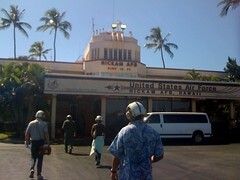 I thought about the regular takeoffs by fighter jets at Hickam Air Force Base. I thought about how you can watch and hear them from downtown Honolulu, windows rattling and the whole sky rumbling as they zipped out, then straight up into the clouds. Even two miles away, these planes are an awesome sight. And here I was, literally a stone’s throw away, as they took to the sky. It was incredible. And amazing how precariously close to certain death so many people were putting themselves every 90 seconds. 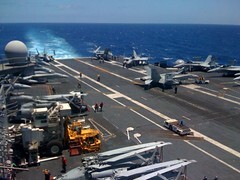 After all the planes were away, we were quickly and carefully led down to the other end of the flight deck. It was time to get an up close and personal look at arrested landings. At our feet, three thick metal cables stretched perpendicularly across and about six inches above the runway. 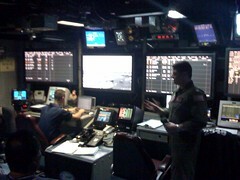 Watching the planes land on the flight deck was, in many ways, even more impressive than watching the catapult launches. Whereas the takeoffs were a demonstration of incredible power and thrust, the landings emphasized precision and skill. Pilots not only had to line up perfectly with the flight deck, but they had to touch down within an impossibly narrow range of maybe 20 yards. 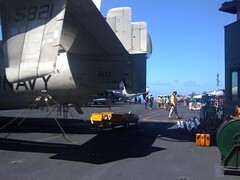 They had to connect their tailhook with one of the three cables so they could be yanked to a stop on the flight deck. And, in fact, the safest cable is the last one. Seeing a fighter jet whip past us but come to a complete stop a few hundred yards away seemed to defy physics. Their engines would be blasting even as they landed, the deck would shake, and we’d get pelted with little bits of rubber. I marveled watching the cables whip across the deck, and watching the Landing Signal Officers across from us wave and point as each plane came in. In addition to the arrested landings, we also got to see a couple of “touch and go” exercises, in which a plane would fly in, touch the deck with its landing gear, then take off again. We also saw a couple of pilots “waved off,” their landings aborted for one of probably a hundred possible reasons. I was completely awestruck as we were led back inside. We returned to the plush stateroom where our tour began, and Capt. Gureck was there to wish us well. We were all given prints of the group photos taken that morning, as well as an embroidered U.S.S. Ronald Reagan cap. Then, we bundled ourselves back up in the vests, helmets, goggles and ear protection, and were led out onto the flight deck one last time. 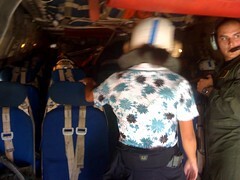 We climbed into the C-2, Neenz and I careful to nab the same seats we had for the flight in. I managed to get strapped in without incident. 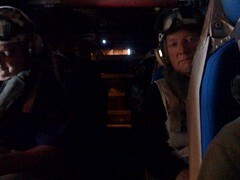 The crew told us that when the time came, we should lean forward, pushing against our restraints, and that we should hold our legs up against the seats in front of us, so that our body would travel as little as possible when we’re hit with high G forces. Then, we waited. And waited. It turned out that we were ahead of schedule, and since everything on an aircraft carrier happens on schedule, we wouldn’t be taking off for a while. So we sat, strapped tightly into our seats in the dark, smoky, noisy and shaking cargo plane, alone with our thoughts and irrational fears for almost half an hour. Suddenly, the crew waved their arms over their heads, and again, the shouting, “Here we go! Here we go!” I held my breath. The catapult launch off the deck of the U.S.S. Ronald Reagan was twice as intense as the arrested landing. We weren’t “thrown forward.” We weren’t “falling.” We were rocketing, erupting, exploding at what felt like warp speed, accelerating so fast that my eyes seemed to bulge and my shoes nearly flew off my feet. It was the longest, most intense four or five seconds I’ve ever experienced. Even after it was over, I had to consciously tell myself to breathe. I think I would have passed out, otherwise. 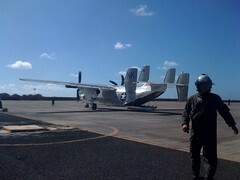 The flight back to Oahu was much shorter than the flight out, because the U.S.S. Ronald Reagan had been traveling towards Honolulu the entire time we were aboard. The ride was a little rougher, and I was just starting to think I’d need to signal for an air sickness bag when we touched down at Hickam. The plane taxied for several minutes, but the crew was kind enough to open the doors as we made our way back to civilization. The sight of the Ko’olau mountains had never been more comforting. 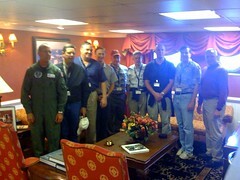 We returned to the visitors lounge where we shed our safety gear and were presented with another group photo and a certificate declaring us “honorary naval aviators.” It was a nice souvenir, a wonderful way to commemorate our experience that day. But if one thing became abundantly clear through this unforgettable experience, it’s that the real naval aviators, the real people of the U.S. Navy and of our armed forces, are made of much more impressive stuff. Until our carrier embark, the closest I’d ever come to military operations were the exercises and ceremonies I witnessed as a child, when my dad served in the Army Reserves. 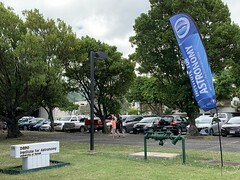 For most of my life, the military was mostly an abstract concept, though growing up and now living in Mililani allowed me to get to know many military families. Now, I’ve seen what some of them do when they’re not at soccer games or missing school assemblies. And I’m amazed and humbled at their dedication and sacrifice. The Navy is very up front about the purpose of the “Distinguished Visitor” embarkation program: bringing in community and business leaders, impressing them, and hoping they go out and tell their stories. Frankly, the military faces a lot of challenges that have nothing to do with foreign enemies, and some of the best “public relations” comes from regular people, not professional spokespeople. Going into this experience, I admit that there was an inner skeptic, an inner liberal, and even even an inner journalist, hoping to stay one step removed from everything, to stay objective and cool headed about everything I saw. But quite simply, this experience blew my mind. Physically, emotionaly, as a civilian and citizen. I enjoy countless rights and privileges as an American, and I’m immensely grateful for the men and women — often, much younger men and women — who make my “everyday life” possible. If you haven’t yet, please check out my HD video of this experience. You can follow Capt. Scott Gureck on Twitter as @scott_gureck and LTJG Theresa Donnelly as @tdonnelly76. Ryan, this is the best blog post that I have ever read here. Your experience truly “put me there” in a somewhat virtual way. 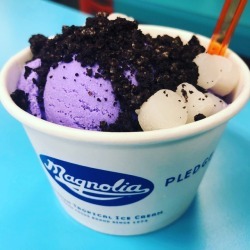 I can tell that this indeed is one of the most unforgettable highlights of your life. It’s one thing to visit a military base and view static displays of aircraft and ships. About the closest thing I’ve experienced that is thrilling were the times I’ve gone out to see the Blue Angels and USAF Thunderbirds roar into town during their tours over the years. The only “at sea” experience I’ve ever had was on the inaugural “return to service” trip by the Hawaii Superferry in December 2007. And that certainly pales in contrast to your U.S.S. Ronald Reagan trip. I loved it when you mentioned the similarity of the carrier’s control room with one on the TV series “Battlestar Galactica”. One of the “making of” video extras in the first season boxed set the series, the producers of that show said they modeled the “Galatica” around the operations of an aircraft carrier. I certainly can see you have gained a good understanding and appreciation of our U.S. Navy and military in general. Thank you for sharing your experience. This story, your photographs and video are truly amazing. Ryan, your perfect descriptions made me relive my “chance in a lifetime” experience that I cannot stop sharing! It’s been only a week or so and it will be as vivid in the years to come…thank you for your re-enactment!